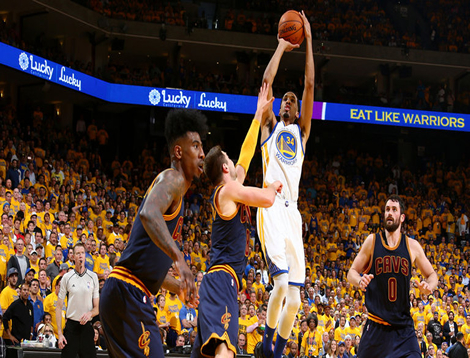 The Golden State Warriors took the lead in the NBA Finals with a 104-89 win over the Cleveland Cavaliers in the opening game of the series. The Cavaliers managed to keep Warriors stars Steph Curry and Klay Thompson quiet, but ran into a strong bench performance from the reigning NBA champions. Curry and Thompson combined for only 20 points, but they were rescued by some poor Cavaliers shooting and superb efforts from bit-part players Shaun Livingston and Leandro Barbosa. “Splash Brothers” Curry and Thompson made only eight of their 27 shots, with Curry contributing a below-par 11 points and Thompson only nine. But with the bench in red-hot form, and Draymond Green not far off a triple-double, fans at the packed Oracle Arena were still able to celebrate a home victory. Green scored 16 points to go with 11 rebounds and seven assists, while Livingston led their scoring assault with 20 points on 8-of-10 shooting. Cleveland’s star players scored well, but their shooting was off target as they hit only 38 per cent of their shots from the floor. LeBron James kicked off his sixth straight finals appearance with 23 points, 12 rebounds and nine assists, while Kyrie Irving, who suffered a serious knee injury in the game one of the finals last year, scored 26 points, 11 of them on free throws. But, where Golden State’s bench players accounted for 45 points, only 10 came from Cleveland’s reserves, much to the delight of Warriors coach Steve Kerr. “We’ve talked about our depth for the last two years. We rely on a lot of people. We play a lot of people, and we feel like we have a lot of talent on the bench that can come in and score when we need it,” said Kerr.